This bank operated from 1857 until 1894. It and The Union Bank of Newfoundland failed in December of 1894. 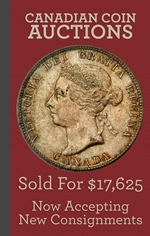 This left Newfoundland without a circulating currency. Of course the situation was quickly remedied by other banks who saw the opportunity to gain the business of the failed banks. 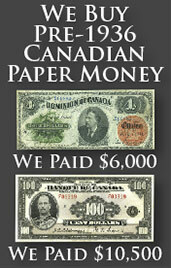 Our guide has more information about paper money issued by The Commercial Bank of Newfoundland. Early bank notes from The Commercial Bank of Newfoundland have simple colors and designs. They are denominated as pounds and sometimes also as dollars. The lower denominations like one pound and five pounds are occasionally available. Ten and twenty pound notes are definitely scarce. Perkins, Bacon & Co. London handled the printing responsibilities. Dates include 25 August 1857, 20 Oct 1858, 5th Oct 1859, 1st Jany 1867, 1st Jany 1874, 1st March 1882, 1st July 1884, and 1st July 1885. Keep in mind that some of these dates are handwritten, so other dates could be out there. Generally speaking, these aren’t the most popular notes from any Canada bank, but they do have a following. Please contact us if you need exact value information. These bank notes have an image of a seal and codfish. Dates include 1st Jan 1881 and 1882, as well as 1st July 1884. The two earlier dated notes can be signed by Henry Cooke and R. Brown. Bank notes from 1884 are signed by H.D. Carter and Henry Cooke. While the design on these Commercial Bank of Newfoundland notes look dated, these are actually the first issues to not include pounds. Examples from 1884 are certainly available. The other two dates are scarce to rare. These are the most available and most modern bank notes issued by The Commercial Bank of Newfoundland. Two, five, ten, twenty, and fifty dollar bills were printed by The British American Bank Note Co. Montreal. Two dollar bills can have an orange tint (as below) or a green tint. All of these notes are dated as Jany 3rd 1888. Higher denominations are much rarer than low denominations. Please contact us if you have value questions. We happily give free appraisals. We buy all types of Canadian currency. We are especially interested in bank notes from The Commercial Bank of Newfoundland in Saint Johns. You might be surprised at how much money we can offer for some currency. Send us an email with pictures of the front and back of your bank note and we will respond quickly with our offer. 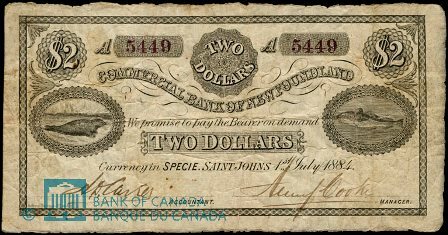 Your piece of currency from The Commercial Bank of Newfoundland in Saint Johns could look similar to the one seen below. Don’t worry if yours is different. Contact us for more value information.